Numerous factors contributed to the growth of Connecticut in the decades following American independence. Among these were the state’s abundant supplies of water for powering industry, its navigable rivers, natural resources, proximity to major metropolitan areas, and access to the sea. Perhaps most important, however, were its people. After utilizing its citizens’ good old-fashioned “Yankee ingenuity” to lay the groundwork for industrialization, the human resources driving Connecticut’s growth in the early 19th century came increasingly from overseas. Waves of immigrants from northern and western Europe helped the state grow and prosper in these early decades of the new century and paved the way for the massive influx of immigrants that occurred in the late 19th and early 20th centuries. In the early decades of the 19th century, immigration to Connecticut, and the country as a whole, proved relatively modest thanks in part to British regulations meant to curb emigration of British artisans and craftsmen to the United States. The peace concluding the Napoleonic Wars, however, along with a steady population increase in northern and western Europe, encouraged some citizens on the continent to follow routes of commerce to new destinations. Prospering economies provided the main draw for these early immigrants, and the burgeoning industries in Connecticut soon had the state accommodating a steadily increasing flow of English, Irish, Scottish, German, and Scandinavian arrivals. Though early 19th-century Connecticut was still primarily agricultural in nature, the state already had a reputation for producing quality clocks and tin ware. In addition, New Haven had a hat factory, nail factory, 2 paper mills, and 17 boot and shoe factories. 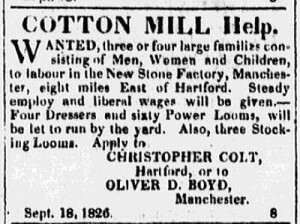 New London already boasted a successful fishing and whaling industry, and Norwich, Hartford, and Middletown all operated cotton mills. While many of these businesses were family-owned and operated or relied on local sources of labor (sometimes utilizing neighbors to manufacture products in their homes and return them to the “factory”), by the middle of the 19th century Connecticut businesses began increasingly opening their doors to labor coming from overseas. Immigration to Connecticut in the middle of the 19th century was characterized by both the forces pushing individuals to leave Europe and those drawing immigrants to Connecticut’s shores. First, a shift in economic circumstances in western Europe drove many western and northern Europeans to seek opportunities elsewhere. Meanwhile, in Connecticut, the utilization of new mechanization processes in industry coupled with the movement of the state’s citizens to lands opening in the West created a demand for new sources of labor. 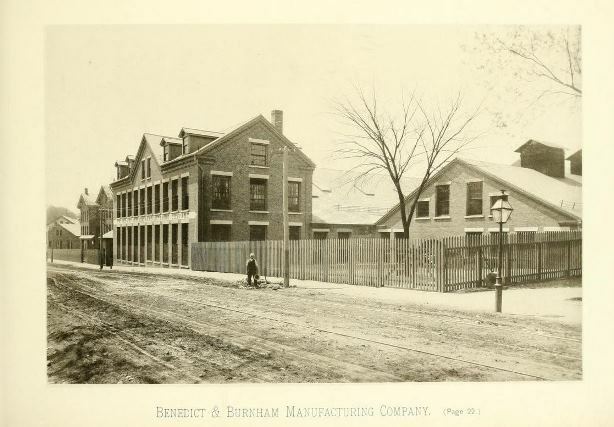 In addition, many Connecticut industries were in their infancy and lacked the skilled and experienced craftsmen and laborers required to operate efficiently. To fill this void, they looked to foreign lands for help. This need played a significant role, for example, in bringing Englishmen to work in the brass mills in Waterbury; it also drew French Canadians into the textile mills in the eastern part of the state. 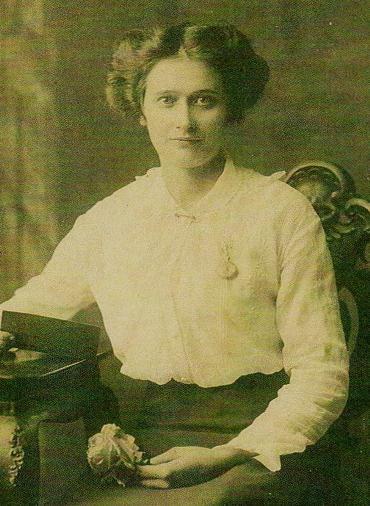 Perhaps no particular group of new arrivals shaped immigration to Connecticut in the first half of the 19th century as much as the Irish. In the 1820s and ’30s, the Irish made up more than one-third of the immigrants arriving in the country and in the 1840s accounted for nearly half. Later in the century, Irish-born citizens made up as much as 20% of the population in several major cities, including Hartford. By the middle of the century, immigration networks increasingly brought entire families and communities to settle in specific areas of the state. While women often took jobs as nannies, maids, and cooks, men provided the labor that helped Connecticut rapidly expand its industrial base. Between 1818 and 1845, the state went from hosting 66 woolen mills and 67 cotton mills to 119 woolen mills and 136 cotton mills. During this same period, the number of hat factories found in Danbury multiplied from 28 to 57, the number of brass foundries in the state soared from 2 to 48 (with 6 in Waterbury alone), and the iron furnaces in Kent went from producing 100 tons of pig iron per year to a whopping 3,000 tons per year. While the immigrants arriving in Connecticut in the first half of the 19th century often found themselves drawn to the state by economic opportunity, the contributions they made did more than expand the state’s manufacturing industries. Their greatest impact came in the ways they helped refashion Connecticut identity. These pioneers brought with them the languages, customs, and practices that defined Connecticut’s increasingly diverse culture, and they blazed a trail for future immigrants from other countries and regions who began reshaping Connecticut communities during the latter half of the century.